Best Natural Arthritis Joint Pain Cream Topical Rubs. Herbal Anti-Inflammation Relief for Muscle Strains & Aches. Does Arthritis Joint Pain & Muscle Strains Slow You Down? Stop the Pain & Get Immediate Soothing Relief in 15 Minutes! Are you suffering from Arthritis Joint Pain and Muscle Aches & Strains? Is this constant sore and ache limiting your daily regular & recreational activities? Jaguar's all natural herbal arthritis & pain cream can help! This best topical pain relief cream contains potent natural nutrients, vitamins & herbs for arthritis joint pain, sore & overworked muscle. It's a best natural cure for joint and muscle ache & pain. Do not waste your money on topical pain treatments that just have minimal effectiveness. 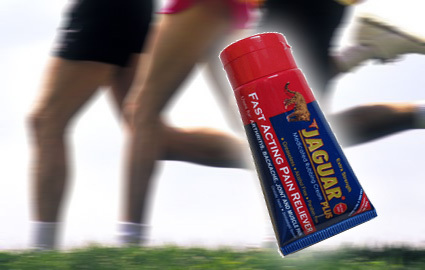 Jaguar, a top topical medicine, is guaranteed to ease the pain or you get your money back! on sore joints works best"
This best & effective topical arthritis joint pain treatment is formulated and manufactured under the direction of a California-based talented medical doctor whose mission is to find the best viable herbal solutions & natural healing to muscle pain, inflammation, and sore arthritis joints. After years of research and development, he finally completed and provided us with an outstanding and revolutionary topical arthritis joint pain remedy. a warming sensation or coolness that would obscures the pain. This technology is particular effective if the location of the pain is not in a structure immediately adjacent to where the cream is applied such as at a joint or bone. Counterirritant ointments are applied to the skin over painful arthritis joints to produce a mild local inflammatory reaction and sensations of heat or cold. By dilating blood vessels, Jaguar raises the temperature and increase blood flow at the pain location. This action transports more healing substances to the injured site. Jaguar arthritis cream applies advanced absorption techniques and latest-researched ingredients to ensure that high concentration of pain-relieving ingredients will be quickly absorbed into the skin to ease arthritis pain, hip sprain, sore muscle.... Our technology will maintain or increase hydration of the outer layer of the skin to promoter greater drug absorption. Jaguar had been clinically tested on 54 patients in a two-month period. The results showed that Jaguar is non-alergenic & non-iIrritating. Furthermore, Jaguar contains 6 additional pain relief natural extracts that work together synergistically to quickly absorb & penetrate the inflammation areas and fight pains such Arnica, Glucosamine, MSM, Thyme, Eucalyptus. MENTHOL is an active ingredient from peppermint oil that increases blood flow to the painful area to relieve minor aches and pains such as muscle cramps and muscle sprain. Dr. Trans has been able to simulate the cooling effect of menthol and deliver it right into your muscle strains, ankle sprain, and sore joints. According to the Journal of Clinical Rheumatology, menthol is one of the best & most effective pain relievers for osteoarthritis patients. When applied to the skin, menthol stimulates the nerves for the perception of cold, while depressing those which perceive pain. The preliminary feeling of coolness is soon followed by a sensation of warmth. SALICYLATE: This active ingredient rapidly penetrates the skin and then relieves in the underlying pain area of muscles and connective tissues for long periods of time to remove the pain and then slowly drifting into the blood stream to be carried away. ARNICA has a history of helping to speed healing of wounds, bruises, sprains, and aches. European herbalists have used this floral extract for centuries to help with sore, tired muscles and carpal tunnel syndrome. Arnica has also been shown in preliminary research to speed the healing of bruises. Glucosamine & MSM are combined to provide a great viable natural treatment to fight arthritis joint pain. The supplementary ingredients of Jaguar work together to provide a skin-nourishing, hydrating base to the four analgesic components, as well as making the product smooth and greaseless. On the inside, Formula for Joints supplement lubricates the joints, enhance anti-inflammation properties, & slowly Rebuild Damaged Cartilages and connective tissues. Doctor-formulated Natural Arthristis Joint Pain & Muscle Ache Topical Rubs Cream works synergistically and effectively with our herbal medicine for joint pain supplement. This exceptional arthritis care combination provides the optimal Inside-Outside pain relief of swollen knees arthritis, stiff finger joint pain, hand arthritis pain, stiff shoulder , hip arthritis & other inflammation. Jaguar arthritis cream & pain reliever quickly attacks the pain from the outside of the skin while Formula for Joints supplement works slowly to ease the joint pain and rebuild the cartilage on the inside.